Children will not always welcome the news that they require glasses. 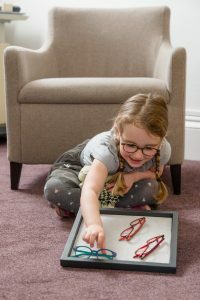 Sometimes wearing glasses is a temporary measure to redress an issue, sometimes children will need vision correction for the rest of their lives. Either way there are plenty of options which can make the transition a straightforward one. We stock a wide range of options for children to suit all, from the budding footballer to the young fashionista. Our frames are stylish, durable and practical. Find out more about our glasses range and how we help you select the perfect frame. Are glasses the only option? No. It is also worth considering contact lenses for some children. There is no minimum age requirement for contact lens wear. Find out more.